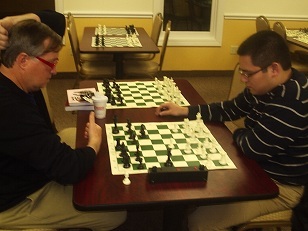 This Friday, our blitz regulars were joined by CT National Master Harris Appelman. Appelman has been inactive in tournament chess for quite some time, but don’t let that fool you. According to him, he has been playing blitz exclusively, even winning the CT Blitz Championship several times. Would he be able to prove his skills at the CCFC? Indeed he did, as he only gave up one draw to Expert Alex Eydelman and defeated NM Ian Harris twice to claim clear first! In second place was Eydelman who also had a good night, defeating Ian Harris twice as well! Join us next week to find out what excitement is in store!